Barnsley head coach Daniel Stendel has resorted to a spot of team building this week in a bid to get his side’s season back on track. The Reds’ unbeaten start to the League One campaign came to an end at Coventry last week following a 1-0 defeat at the Ricoh Arena. That prompted Stendel to take his players to Total Ninja in Manchester on Wednesday to participate in a series of obstacles aimed to help build team spirit ahead of Saturday’s game with Burton at Oakwell. The German said at his pre-match press call: “Yesterday we had a team event, team building, with some fun. We are all ninjas now! “It is not only what we learn, but it is important for the team that we have fun together, laughing at me or other players. “In the dressing room we spoke about what was good and not so good about the day. Adventures together bring us closer together. It was good. 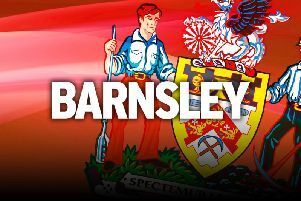 Barnsley were heading for a point at Coventry, where they have still not won for 95 years, until Jordan Willis nodded in a late winner. That was their first defeat of the league campaign in their eighth outing, denying Stendel the opportunity to record the best league start by a Reds boss. They have a chance to bounce back on Saturday when they welcome Burton, who like Barnsley were relegated from the Championship last term, to South Yorkshire. “It is normal that you lose a game and it is better to do it later than earlier,” Stendel said. “I could have waited after 30 games, but it was eight! It is important that we remember the basics for our successful start. I hope all players understand that. “We watch in training that players try to change their behaviour and play to their first games. Stendel also announced striker Cauley Woodrow, a recent signing from Fulham, is still a fortnight away from making his Barnsley debut. “Cauley, we tried last week that he could play, be in the squad, at Coventry but it was too early,” he added.